5232 ✉ \"Mol. 1. VI. 06\" manuscript cancellation on double postal stationery 5 Pfg. / 5 Pfg. 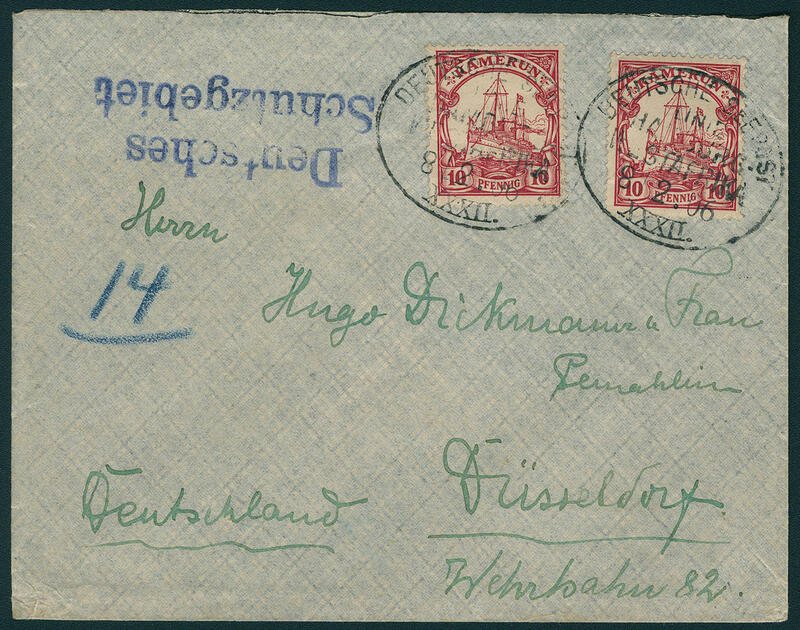 Ships, with additional station stamp \"SANGA NGOKO\" in black to Berlin-Charlottenburg, receiver name deleted, slight traces of usage, with arrival postmark \"CHARLOTTENBURG 10.7.06\". 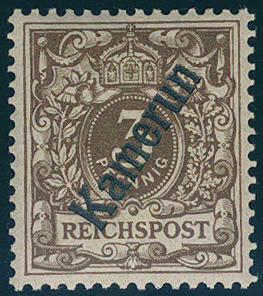 This is a the rarest cancellations of the German colonies. Photo expertize Eibenstein BPP. 5233 ✉ \"SOUFFLAY\", the scarce blue single line cancel on very nice small-format registered cover with 10 Pfg. And 20 Pfg. 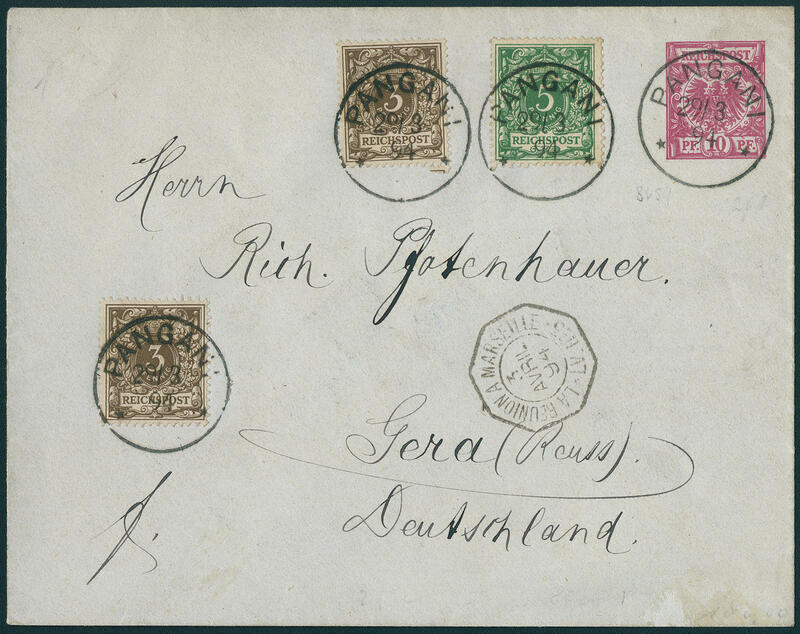 Ships, with provisional registered note, the stamps with additional tenderly two ring cancel \"Mollundu\" once again additional, to Germany with arrival postmark \"LÖDERBURG 28.10.13\", a very nice cover of this rare cancellation, expertized from Willmann, Bothe BPP. 5234 ✉ \"SOUFFLAY 3. XII. 12. 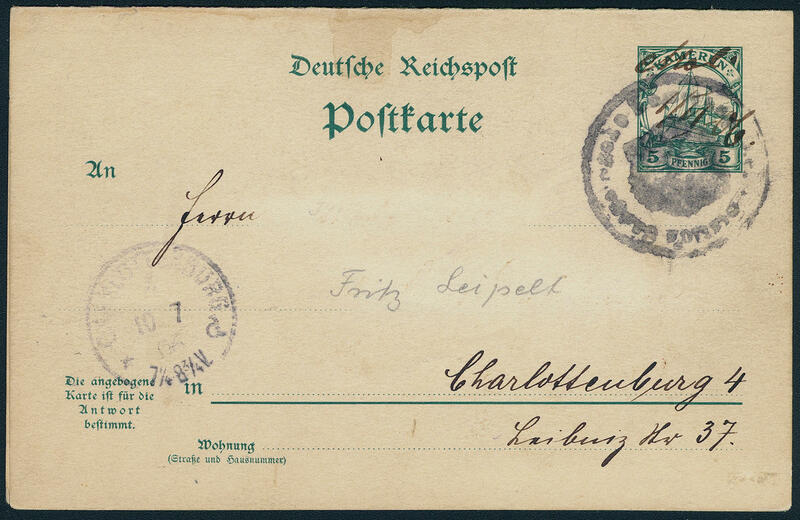 \", the scarce small single line cancel with handwritten date on picture postcard with 5 Pfg. 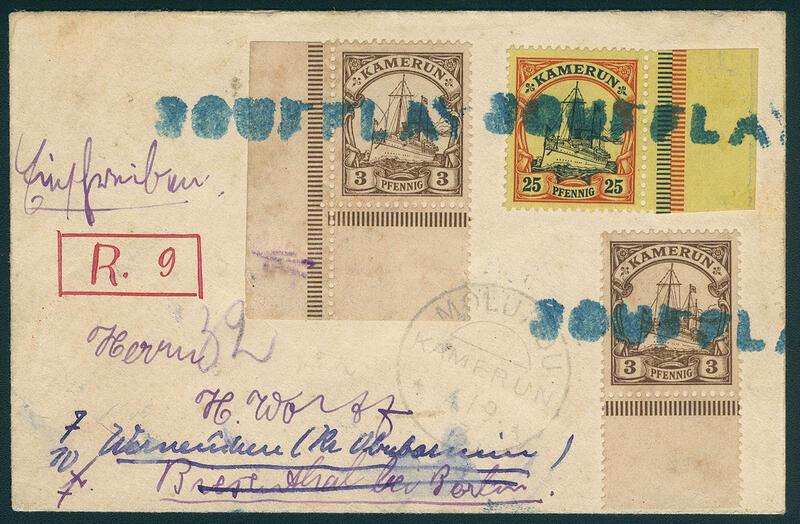 Ships to Mollundu with arrival postmark \"Mollundu 7.12.12\", very decorative and rare! 5235 ∆ \"MORA 18.5.14\", the scarce stamp twice razor-sharp perfect on white on piece in outstanding quality with horizontal lower margin pair 25 Pfg. With edge lettering \"Cameroon\". 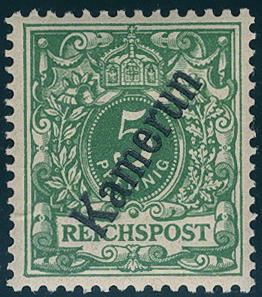 The seeming most beautiful letter piece this cancellation rarity, for your highest requirements! Photo expertize Jäschke-Lantelme BPP. 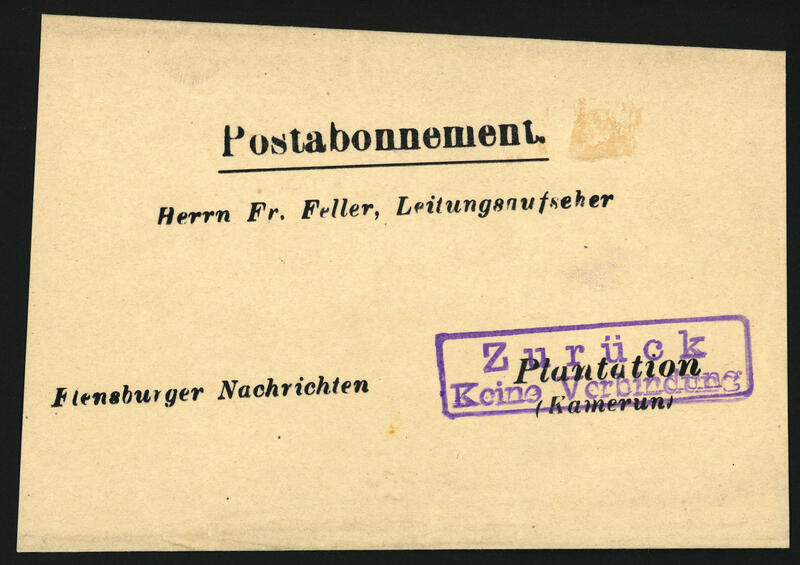 5230 ✉ War mails newspaper wrapper the Flensburger messages, post subscription to Plan deed ion / Cameroon with violet box cancel of 2 lines \"return no link up\" and on the back dated postmark \"16. December 1914\". Postal history rarity from the wartime. 5214 1/6B 3-50 Pfg. Crown / eagle with especially strong overprint \"Cameroon\", wonderful fresh colors and very well perforated, in perfect condition mint never hinged, only 10 Pfg. With tiny hinge trace. 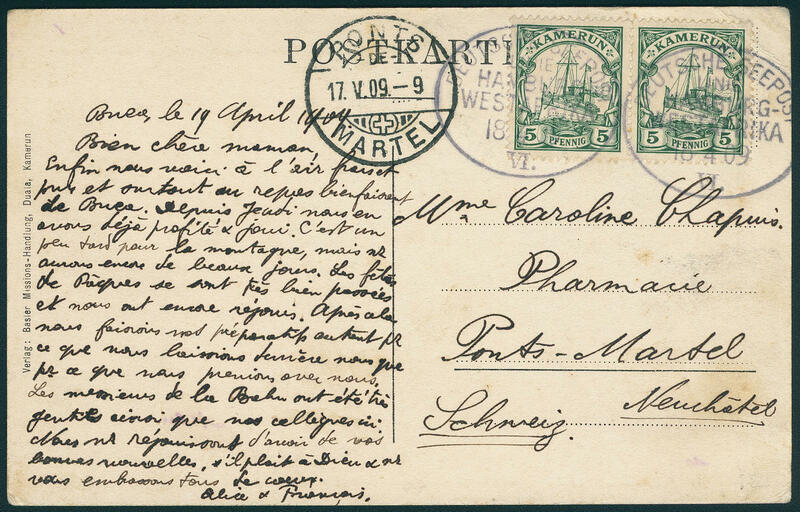 It is a matter herewith about the very scarce issue for the Universal Postal Union in Bern. The edition amounted to be on only 800 sets, from which probably only still few sets have been preserved are. A rarity of this area! Expertized Bothe BPP. 5215 ⊙ 6Abart 50 Pfg. 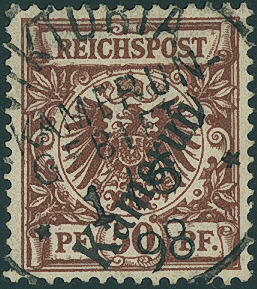 Bright red brown with extremely strong downward shifted overprint \"Cameroon\", fresh colors and very well perforated, especially nice centric cancellation \"VIKTORIA 1.6.98\". There are very few examples of this variety have become known! Photo expertize Eibenstein BPP. 5216 ✉ 7,11 3 Pfg. 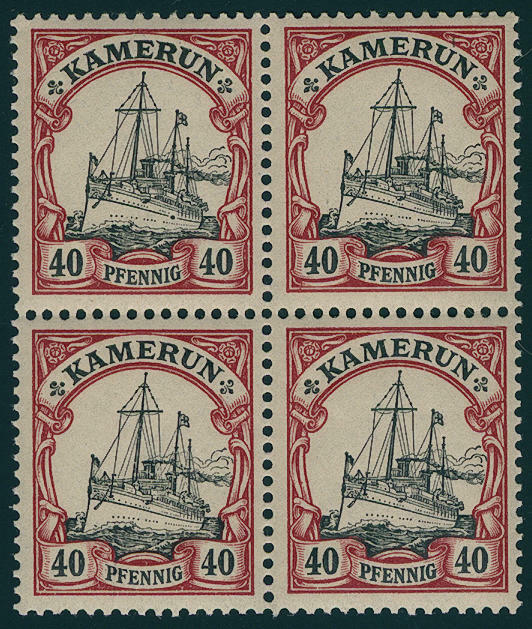 Imperial yacht from lower margin respectively from the left lower corner of the sheet, as well 25 Pfg. From right margin of sheet on decorative small-format registered cover with provisional registered note and three times ivory cancel \"SOUFFLAY\" in blue with additional stamp \"Mollundu 4.9.13. 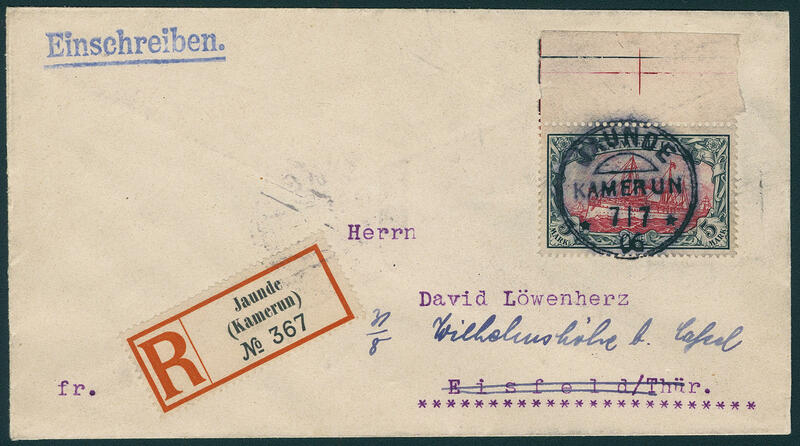 \" to Biesenthal and forwarded to Werneuchen with arrival postmarks. A very nice cover! 5217 ✉ 7,9/10 3 Pfg., 10 Pfg. And 20 Pfg. 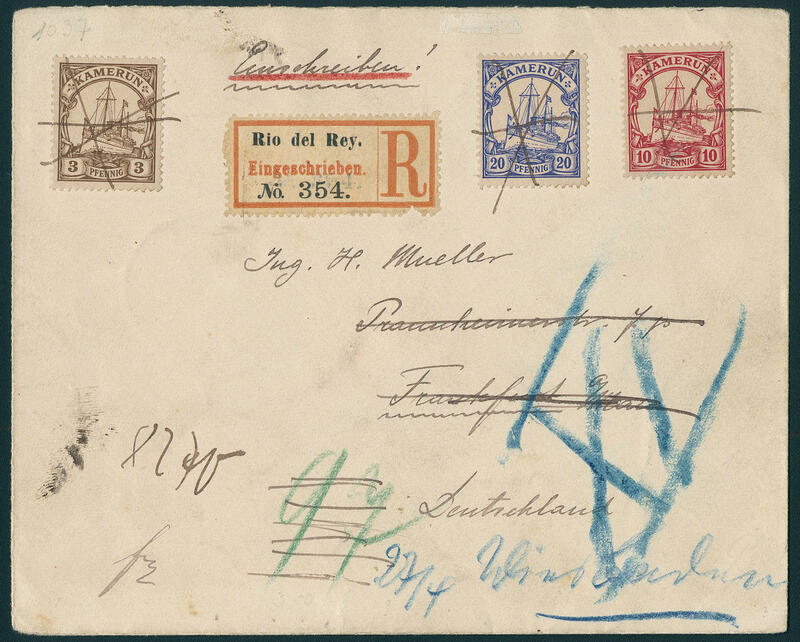 Ships unwatermarked as decorative three colours franking on registered cover with rare handwritten cancellation from \"RIO DEL REY\" to Frankfurt with arrival postmark \"FRANKFURT 27.4.01. \" and forwarded to Wiesbaden with arrival postmark from same days. In this kind an extraordinary document! 5218 ✉ 9 10 Pfg. 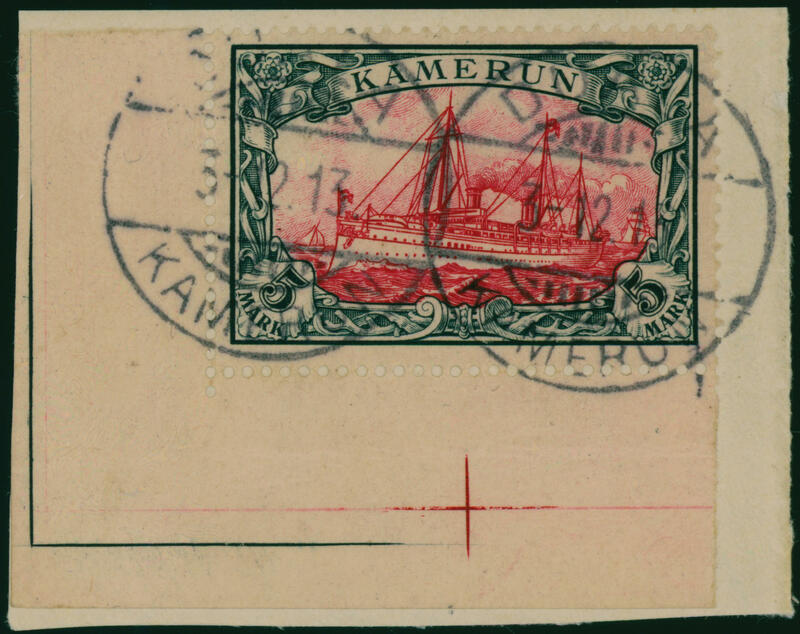 Ships unwatermarked, faultless multiple franking on very nice small-format cover with shipÂ´s cancel \"German Naval line Hamburg West Africa XXXII 8.2.06\" (inverted today's date) with additional blue two-line cancel \"German protectorate\" to Düsseldorf with arrival postmark. The cover was transported with the steamer \"LUCIE WOERMANN\". A very fine example! 5219 ✉ 10H 20 Pfg. Imperial yacht, vertical bisects (right half) the famous so-called \"LONGJI Provisional arrangement\", fresh colors and faultless condition on very nice cover from \"LONGJI Cameroon 19.5.11. 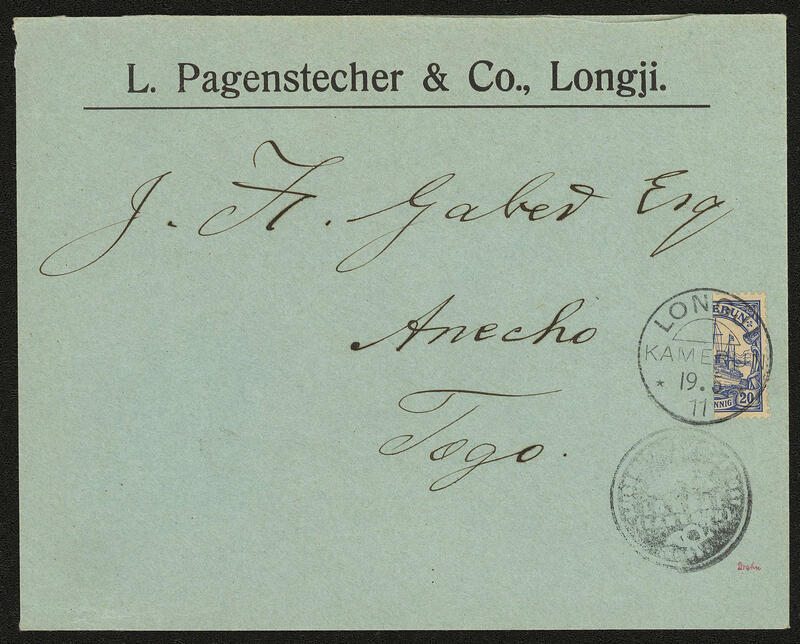 \" with additional seal of office \"imperial German post LONGJI (Cameroon) \" to Anecho / Togo. An especially nice cover this colonial rarity! Photo expertize Steuer BPP. Michel 9000,- €. 5220 13II 40 Pfg. 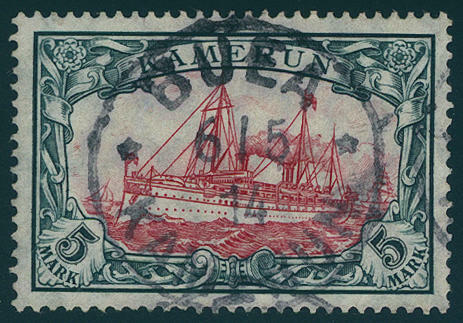 Imperial yacht with scarce plate flaw \"dot in the ship sideline underneath of the rear chimney\" block of four with normal stamps se-tenant, fresh colors and very well perforated, in perfect condition mint never hinged, without any signs. A wonderful unit in first-class quality. Photo expertize \"faultless mint never hinged condition\" Jäschke-Lantelme BPP. 5221 18Probe 3 Mk. Black violet, extraordinarily rare proof on watermarked paper with different colour to the later issued stamp, fresh colors and very well perforated, in perfect condition unused. Trial proofs the Mark values on watermarked paper are general very rare. 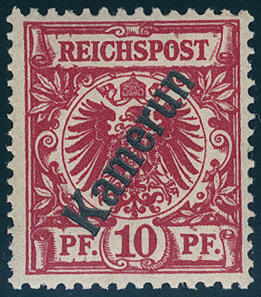 In this kind with different colour a rarity of the German colonies! Photo expertize Steuer BPP. 5222 ∆ 19 5 Mk. Green black / red from the left lower corner of the sheet with marker cross on margin to facilitate cutting or perforating of panes on beautiful white letter piece, perfect turning into cancelled \"DUALA 3.12.13\". An exception copy for your highest requirements! Expertized Bothe BPP. 5223 ✉ 19 5 Mk. 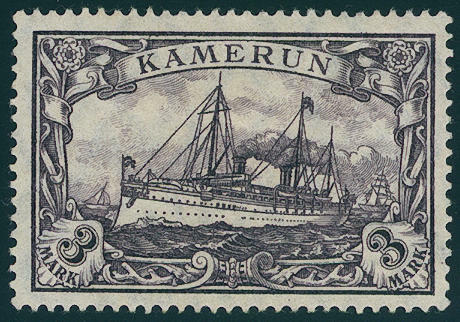 Imperial yacht from upper margin, in perfect condition on decorative small-format registered cover with good stamp \"Yaoundê Cameroon 5.7.06\" to Eisfeld / Thuringia with arrival postmark and forwarded to Wilhelmshöhe by Kassel. An attractive document! 5224 ✉ 21I 5 Pfg. 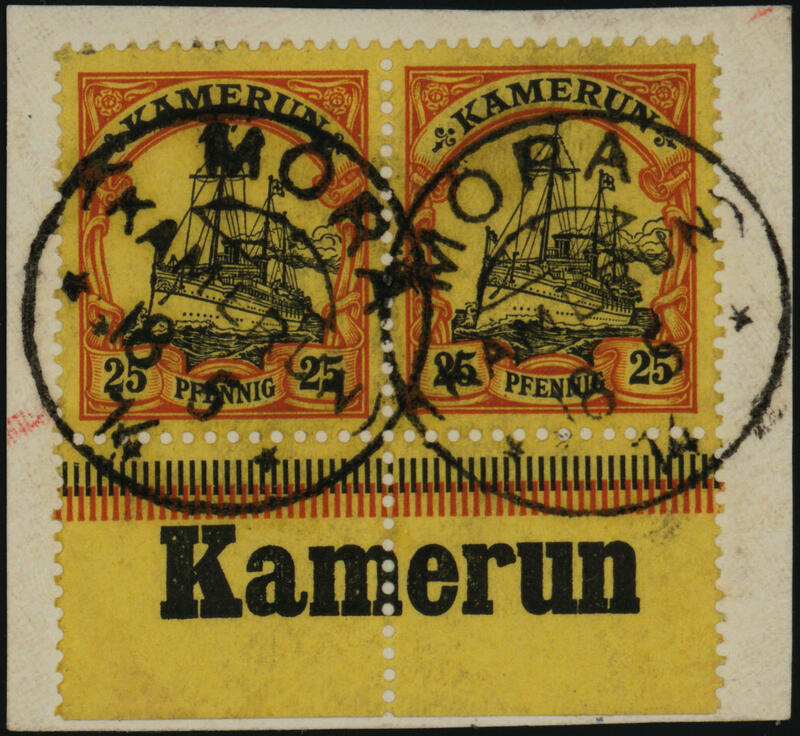 Ships, horizontal pair on correctly franked picture postcard \"HAUSA near the area IN BAMUM\" with clear shipÂ´s cancel \"German Naval line Hamburg West Africa VI 18.4.09\" to Ponts / Martel / Switzerland with arrival postmark. Rare! 5225 ⊙ 25IA 5 Mk. Green black / carmine red, 26:17 perforation holes, watermarked, fresh colors and very well perforated from left margin of sheet with marker cross on margin to facilitate cutting or perforating of panes, very nice canceled \"DUALA 3.4.14. \". A definitely exception copy this large colonial rarity, whereby the watermark in the margin of sheet also from in front especially good to see is. Photo expertize Bothe BPP. 5226 ⊙ 25IA 5 Mk. Imperial yacht watermarked, fresh colors and in perfect condition, very fine on self-formed pages from \"BUEA Cameroon 6.5.14. \". 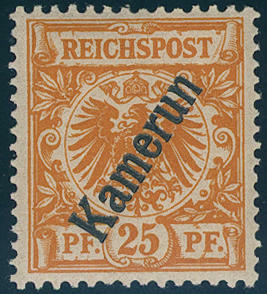 An exception copy of this rare and sought-after issue! Photo expertize \"entirely perfect\" Dr. Steuer. 5142 ✉ 45b,46c 3 Pfg. Mid-brown (2), 5 Pfg. Opal green on postal stationery envelope 10 Pfg. 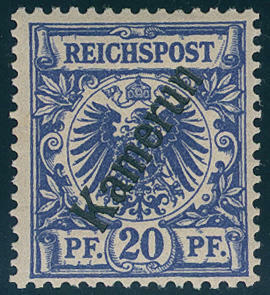 Crown / eagle (large size) as very nice follower use with clear single circle postmark \"PANGANI 29.3.94\" to Gera with transit and arrival postmarks \"ZANZIBAR 1. AVRIL. 94\", \"MARSEILLE 3. AVRIL. 94\" and \"GERA 22.4.94\". A wonderful combination with rare cancellation! 5143 ✉ VP21 10 Pfg. Crown / eagle, postal stationery fresh colors and in perfect condition clean commercially used with detailed text and pricked neat postmark \"ZANZIBAR Imperial German postal service agency 7.12.90. 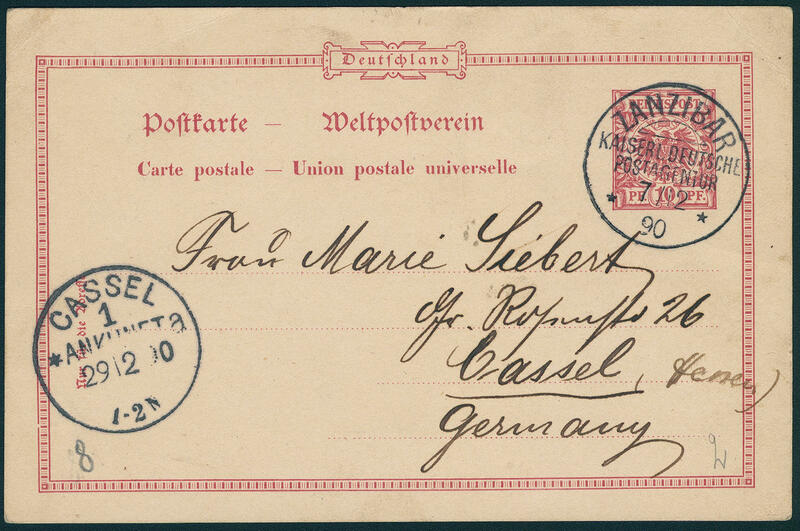 \" to Cassel with arrival postmark. A scarce forerunner postal stationery this sought-after post office in excellent quality!